The Battle of Taos in 1847, during the Mexican-American War, depicting the death of Captain John H.K. Burgwin during the siege of the Taos Pueblo. The Taos Revolt was an insurrection in January 1847 by Hispano and Puebloan allies against the United States’ occupation of present-day northern New Mexico during the Mexican–American War. 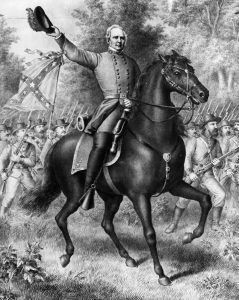 During the war, General Stephen W. Kearny was ordered from Fort Leavenworth, Kansas to the southwest to secure the New Mexico territory. 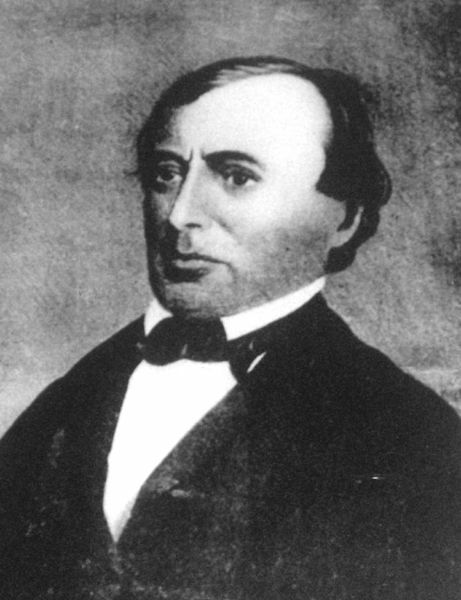 When he, along with 1,700 troops marched into Santa Fe, unchallenged, on August 15, 1846, Governor Manuel Armijo surrendered without a shot being fired and soon retreated to Chihuahua, Mexico. 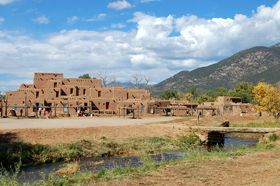 Kearny, in his famous first speech in Santa Fe, assured the people that the United States government would respect their property and their religion and protect them from marauding Indians. Within just a few days Kearny established a new system, dubbed the “Kearny Code,” and began to form a civilian government, appointing Charles Bent as New Mexico’s first territorial governor and Charles Beaubien as one of three federal judges. He then left Colonel Sterling Price in command of U.S. forces in New Mexico departed with his forces for California. Though many New Mexicans were un-reconciled to Armijo’s easy surrender, they initially put up no organized resistance. However, they were worried about their land titles and resented their treatment by U.S. soldiers, who digressed sometimes into cruel occupiers — requisitioning food and items from merchants without paying, abusing the women, and littering the villages. Finally, due in large part to the efforts of a few paranoid and anti-American priests, the Mexicans came to fear for the future of their Catholic church. Over time, the resentment grew and dissenters plotted a Christmas uprising in Santa Fe. However, their plans were discovered by the US authorities, thwarted, and several of them were arrested. 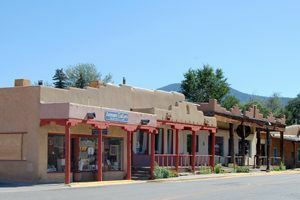 Just weeks later, in the city of Taos, New Mexico, a revolt, led by Pablo Montoya, a Hispano who called himself “the Santa Ana of the North,” and Tomás Romero, a Taos Puebloan, began on the morning of January 19, 1847. Though Governor Charles Bent’s offices were in Santa Fe, his residence was in Taos. That morning, Tomás Romero led a Native American force to Bent’s home, broke down the door, shot the governor with arrows in the face and scalped him in front of his family and killed Bent’s brother-in-law, Pablo Jaramillo, before moving on. However, Bent was still alive and with his wife and children, as well as Kit Carson’s wife, who was staying with them, soon escaped. Later when the insurgents discovered them, they killed Bent but left the rest of his family unharmed. The massacre did not stop for two days. The mob destroyed American homes and slaughtered their inhabitants. They shot down Taos Sheriff Stephen Lee as he hid atop his roof. They discovered 19-year-old Narcisso Beaubien, son of Judge Charles Beaubien, who was absent at the time, huddled beneath a water trough, and lanced him to death. They also killed Cornelio Vigil, an attorney and probate judge and J.W. Leal, circuit attorney. They broke into Kit Carson’s house, who was away with General Kearny in California and pillaged everything. From there, the rebellion spread across northern New Mexico, as dispersed bands of Mexicans and Indians attacked American wagons, camps, and ranches. On January 20th an armed force of approximately 500 Hispano and Pueblo Indians attacked Simeon Turley’s mill and distillery in Arroyo Hondo, several miles outside of Taos. Inside the mill were about 8-10 mountain men including William LeBlanc, John David Albert, and Tom Tobin. After a day-long battle, only Simeon Turley, John David Albert, and William LeBlanc survived. Six men were killed and the mill was burned to the ground. Simeon Turley was killed a short time later when one of his native “friends” disclosed his whereabouts. The same day, Hispano insurgents killed seven or eight American traders who were passing through the village of Mora, New Mexico on their way to Missouri. On January 21st, Colonel Price led more than 300 U.S. troops and 65 volunteers organized by Ceran St. Vrain, the business partner of Bent brothers, from Santa Fe to Taos. Along the way, the combined forces beat back a force of some 1,500 Hispano and Pueblo Indians at Santa Cruz and Embudo Pass. 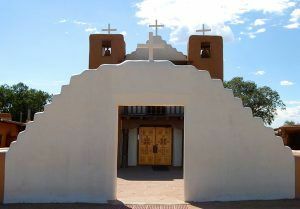 The insurgents then retreated to the Taos Pueblo, where they took refuge in the thick-walled adobe church. 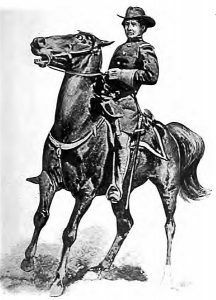 In the meantime, US Army Captain Israel R. Hendley of the Second Missouri Volunteers learned of the insurrection when he and his troops were situated along the Pecos River. On January 22nd, Hendley learned that the rebels had gathered a force of 150 or more men in Mora, where he headed with 80 of his men. Two days later, he arrived in Mora where he found a body of Mexicans under arms, prepared to defend the town. He and his troops were attacked and Hendley was killed. This confrontation is known as the First Battle of Mora. A separate force of US troops campaigned against the rebels again in Mora on February 1, 1847. The attack led by Captain Jesse I. Morin, known as the Second Battle of Mora, destroyed the village, which ended the Mora campaign of the revolt. On February 3rd, Colonel Sterling Price marched through the city of Taos, New Mexico unopposed, before continuing on to the Taos Pueblo, where he found the rebels had strongly fortified themselves in church. A “new” San Geronimo Mission was built in 1850. The youngest of the structures in the pueblo, it still services parishioners today, Kathy Weiser-Alexander. There, the soldiers directed a cannon at the church, blowing holes in its thick adobe walls. In the ensuing battle, about 150 rebels were killed, another 400 more were captured, and the church nearly destroyed. Seven Americans were killed, including Captain John H. K. Burgwin, for whom Fort Burgwin was later named. The next day, the rebels surrendered. In the battle, several rebels were captured, including the two rebellion leaders, Pablo Montoya and Tomás Romero. Romero was imprisoned and the day after the battle was shot in his cell by Private Fitzgerald before he could be brought to trial. On February 6th, Montoya was brought to trial, was convicted of treason, and was quickly sentenced to death. He was hanged in Taos on February 7, 1847. Later trials resulted in 14 additional public hangings occurring on April 9, April 30, and May 7. Presiding over this court was none other than Judge Charles Beaubien, father of the slain Narciso and, coincidentally, father-in-law of Sheriff Stephen Lee. Though the last official battle of the Taos Revolt was the Siege of Taos, New Mexican rebels engaged U.S. forces three more times in the following months, including the Battle of Red River Canyon, the Battle of Las Vegas, and the Battle of Cienega Creek. © Kathy Weiser-Alexander, June 2018. I find the “eyewitness” comment at the end of the article to put an anti-American spin on the whole of America’s action to hold individuals accountable for murder. I can understand how Mr. Garrod might see it the way he comments given that the war had just ended, but the article author seems to have selected one eyewitness account that perhaps was consistent with how the author feels about America’s action in this incident? Maybe the author was just trying to show how despondent the captors were? In either case, it comes across as anti-American in my opinion. – Mr. Garrod says in dismay that Americans arraigned “revolting inhabitants for treason” – no, they were arraigned for murder. – “What did the poor devil know about his new allegiance?”; this isn’t a situation of confusion over allegiance. Adults know the difference between protesting and murder! – “…murdering those who defended to the last their country and their homes.” No, holding people accountable for their actions. It’s what adults do or at least are supposed to do. History is history, and we simply love American history and present it as is, warts and all. This was during a war, in “occupied territory”, before New Mexico was a state in our Union. War is brutal, but I personally would expect those being conquered, occupied, etc, to fight back..would you if America were invaded today? Or would you do what you describe as the “adult” thing and simply let it happen? And if you did fight back, who are the jury of your peers? The invader/occupiers of the foreign entity that invaded, or your fellow neighbors? Are you saying that if Mexico should invade and take over a state in our country today that all citizens should automatically pledge allegiance to Mexico, and that no citizen should be tried for treason by Mexico if they don’t? We’re proud U.S. citizens and love our country, but history is what it is, and Westward Expansion was often brutal.